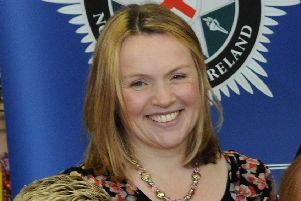 Mrs Lynda Currie, principal at Lurgan Junior High School. A Parents Forum is being set up at Lurgan Junior High School to give people their say on the current consultation around the closure of Craigavon Senior High School. In an open letter to parents and friends school principal Mrs Lynda Currie thanked all those who attended the first of the consultation meeting held at the school on Monday. She said: “Your responses were strong, child centred and focused on the needs of Lurgan children and those who travel into Lurgan from the outlying areas. “As parents of our children you ably demonstrated our solid community links, your concern for the young people in our care and for prospective pupils coming to LJHS. “I applaud your commitment, the manner in which you so respectfully expressed your viewpoints and your ability to see that all that was on offer were bus passes and modular accommodation (porta cabins) to extend teaching space at the Portadown Campus of Craigavon Senior High School. “As Mr Michael McConkey (Education Authority) and his colleagues went to great lengths to assure us that this was only the beginning of the process, it is now time to take them up on one of the strategies they repeatedly recommended in order to take the process forward thus reflecting community feeling. “As such, I would like to facilitate you in setting up a Parent Forum for all interested parties. “To many present, it would have appeared that the proposal was very much a ‘fait accompli’ but we received several reassurances that this was not so, that it was not a numbers game but instead an opportunity to listen to your views and give you time to find your voice and use it to bring about the best educational outcomes for all our children. Elections to the committee will be held on the same evening.